Building below cities is a high-risk activity, and so there is a major emphasis on the reliability and the strength of the structures, and on the limitation of local disruption. 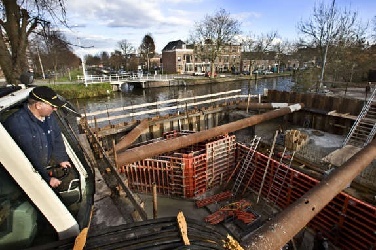 Deltares has unique, specialist expertise relating to all aspects of underground structures, for example car parks, or bored tunnels such as those used for the North-South Metro line in Amsterdam. From the reliability of pile structures to the impact of construction work on the locality: we map out the structures involved through research, models and analysis before, during and after the construction work. We also advise about how to reduce local disruption and how to manage stakeholder expectations better. Building below cities involves risks for the locality. Conducting timely risk analyses can help to mitigate effects such as noise, vibrations and subsidence. Deltares describes what is needed to reduce local disruption. Where necessary, we provide additional information by conducting either simple surveys or extensive research. If there are unexpected setbacks during building projects, Deltares immediately establishes teams with specialists from a range of disciplines. They deliver total consultancy: technical solutions in combination with risk surveys and support for communications with stakeholders. The public at large is becoming increasingly critical about the impact of construction projects on the locality. As a result, the predictability of local disruption can be a major factor in determining support for the building work. Sound communications and the drafting of alternative scenarios can enhance acceptance by local residents and other stakeholders. The Deltares specialists help government authorities and project organisations with this process. For example, we have developed a tool that quickly establishes a picture of the impact risks associated with proposed construction projects. Managers can use the results to improve the structuring of the decision-making process. In practice, it has emerged that underground structures often fail to live up to expectations. Deltares develops knowledge that lengthens the lifetimes, and improves the reliability, of tunnels, excavation pits and pile structures. We also work on quality controls and monitoring tools for structures built in the ground such as piles and D-walls. Deltares advises about designs, but we can also contribute to the reliability of a structure during or after the construction process. the MaterialPathMethod for calculating large deformations.